The Pentagon has admitted that its air campaign in Mosul “probably had a role” in the mounting civilian death toll in Mosul, including the recent loss of dozens of lives under the rubble of a house that was allegedly booby-trapped by ISIS to maximize casualties. Mounting evidence of an underreported civilian death toll in Mosul has recently been noted by Human Rights Watch and Amnesty International. Both organizations have criticized the modus operandi of the US-led military campaign. 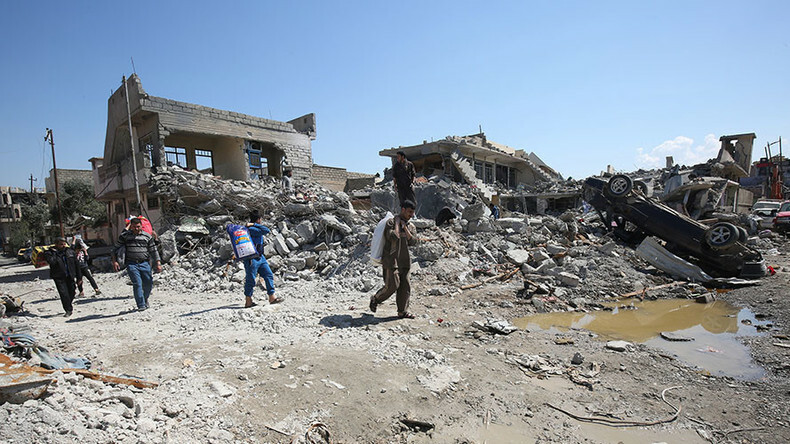 Entire families in Mosul are being killed by airstrikes in their own homes following repeated instructions from Iraqi authorities to stay inside, AI said this week. The NGO emphasized that the coalition forces must have known the strikes were likely to result in civilian deaths. 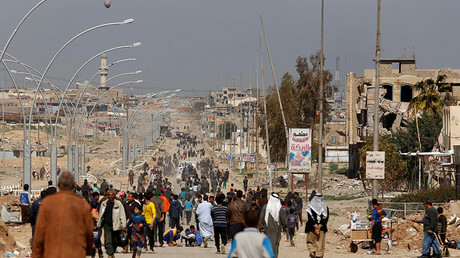 In one of the deadliest single incidents of the Mosul siege, dozens of people lost their lives in the Jadida neighborhood on March 17. 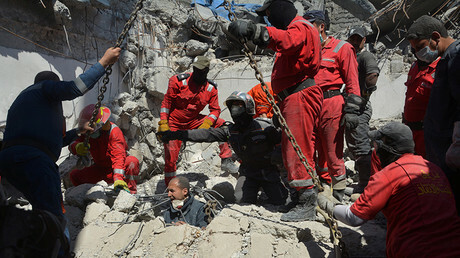 With the exact number of casualties still unclear, Mosul's municipality chief, Abdul Sattar al-Habbo, who was supervising the rescue, said 240 bodies had been pulled from the rubble. Confirming that the US is conducting its own investigation into the March 17 incident, the Pentagon has admitted that its air power could have been a contributing factor to the mounting civilian death toll. “My initial assessment is that we probably had a role in these casualties. Now, here’s what I don’t know: What I don’t know is were they, (the civilians), gathered there by the enemy? We still have some assessments to do,” Lieutenant General Steve Townsend told a Pentagon news briefing, pointing out that there are numerous conflicting reports about the extent of the damage from the March 17 strike. The Iraqi War Media Cell — which the Pentagon referred RT to for further details on the March 17 incident — said the building could have been blown up by terrorists who “booby-trapped” the building. “No hole or other indication” was discovered to suggest that the US coalition had struck the building directly, it said. “If these innocents were killed by the coalition, it was an unintentional accident of war,” the commander of the Combined Joint Task Force-Operation Inherent Resolve added. The US commander also emphasized that the battle to liberate the western portion of Mosul is extremely challenging due to urban warfare where jihadists use civilians as human shields. So if the coalition strikes a building that turns out to have had civilians inside, according to the general, it is safe to assume that they were forced to stay there. “We know that the ISIS were fighting from that position, from that building, and there were people that you really can’t account for in any other way in any other way of why they would all be there unless they were forced there,” Townsend said. While acknowledging the possibility of collateral damage, the US commander assured reporters that US warfare tactics are designed to preserve human lives. Earlier, the US declared that its forces are not planning to change the way they conduct airstrikes despite the battle for Mosul entering more densely-populated areas, raising the spectre of even more civilian deaths. “What has not changed is our care, our caution, our applications of the rules of force, how and when we apply our combat power, our tolerance for human, civilian casualties. None of that has changed,” the head of the US anti-ISIS coalition stressed. “We set the highest standards for protecting civilians. It is my view, that our dedication, diligence, and discipline in prosecuting our combat operations while protecting civilians, is without precedent in recorded history of warfare. None of this changes the basic facts, though. Civilians are dying in Mosul. Most of them are dying at the hands of ISIS and that’s the real horror, the real tragedy of Mosul,” the general concluded. Meanwhile, the UN Human Rights chief, Zeid Ra'ad al-Hussein, has condemned the “massive loss of civilian lives in western Mosul,” where according to the official body count, at least 307 people have been killed and 273 wounded in just over a month.